Pride in their organizations’ mission, fairness in the treatment of women and ethnic minorities, flexible work schedules — these are just a handful of workplace characteristics that employees of this year’s 100 Best Nonprofits appreciate about their organizations. Pride in their organizations’ mission, fairness in the treatment of women and ethnic minorities, flexible work schedules — these are just a handful of workplace characteristics that employees of this year’s 100 Best Nonprofits appreciate about their organizations. But not all is smooth sailing for the 100 Best. Staffers have low satisfaction rates for pay and benefits, as well as opportunities for promotion and training. 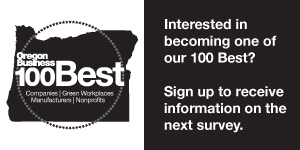 More than 180 nonprofits and approximately 5,500 employees took part this year in Oregon Business magazine’s sixth annual 100 Best Nonprofits to Work For in Oregon survey. Participants came from a wide variety of sectors, including environmental, social service and education. Results of the survey show employees of nonprofits have high average rates of pride and belief in their organizations’ missions, and they rate highly their workplaces’ progress in achieving their goals and purpose. “Staff and volunteers believe in and work toward accomplishing the mission in a fun, energized and creative culture,” says a staffer. Nonprofits also do better than other sectors at providing equal opportunities to women and minorities. One of the highest average satisfaction rates employees gave their organizations was in the fair treatment of differing racial, gender, sexual orientation, disability, age and economic groups. On average, more than 60% of the 100 Best Nonprofits employ women in senior management roles — an above average rate compared with for-profit private and public companies. The 100 Best Nonprofits are good places to work if you have a young family or obligations that require flexible work schedules. Employees of the 100 Best show a high average satisfaction rate for their workplaces’ flexibility in allowing employees to balance family, community and job obligations. “I have greatly appreciated the flexibility that has been offered when I have needed to prioritize parenting responsibilities,” one employee says. The survey shows nonprofits lag behind on providing adequate benefits and compensation. Employees show a low average satisfaction rate for their organizations’ willingness to provide pay increases and benefits. Employees are less content with opportunities for promotion and training, as well as rewards and acknowledgement for making progress in their jobs. “I would like to see more opportunities for staff to receive raises to reward their hard work. I believe it would greatly impact retention in the work they do,” says an employee. The 100 Best Nonprofits may do a good job at fulfilling their purpose and mission, but employees, unsurprisingly, also care about salary, benefits and opportunities to advance within their organizations.